That Makes Cents to Me Madden/Bitka 2006 From Jack Hartmanns Math in Motion CD. 2 Penny 1 A penny equals one cent. 3 Nickel 5 A nickel equals five cents. 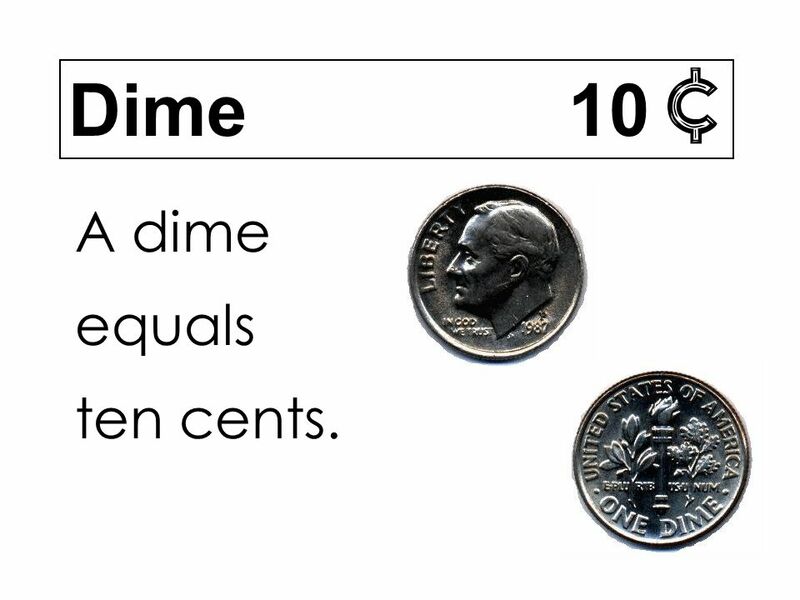 4 Dime 10 A dime equals ten cents. 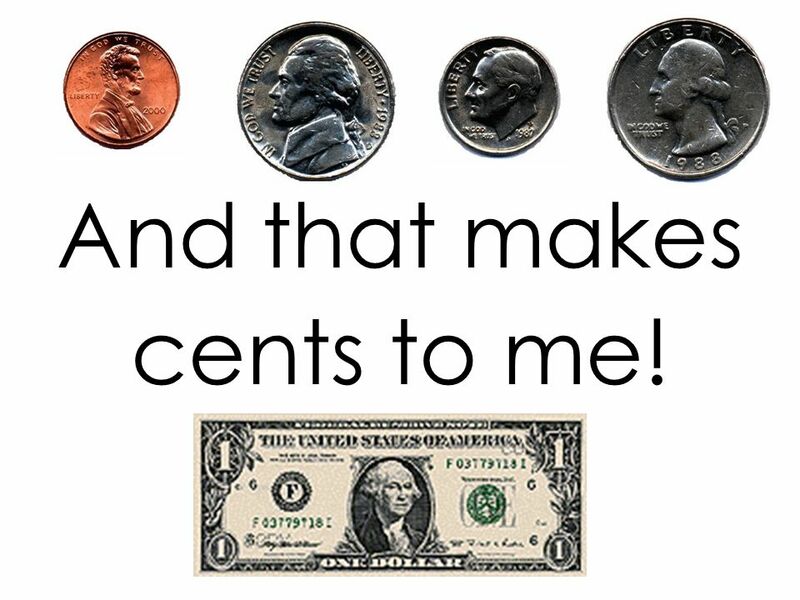 5 And that makes cents to me! 6 Quarter 25 A quarter equals twenty-five cents. 7 Half-Dollar 50 A half-dollar equals fifty cents. 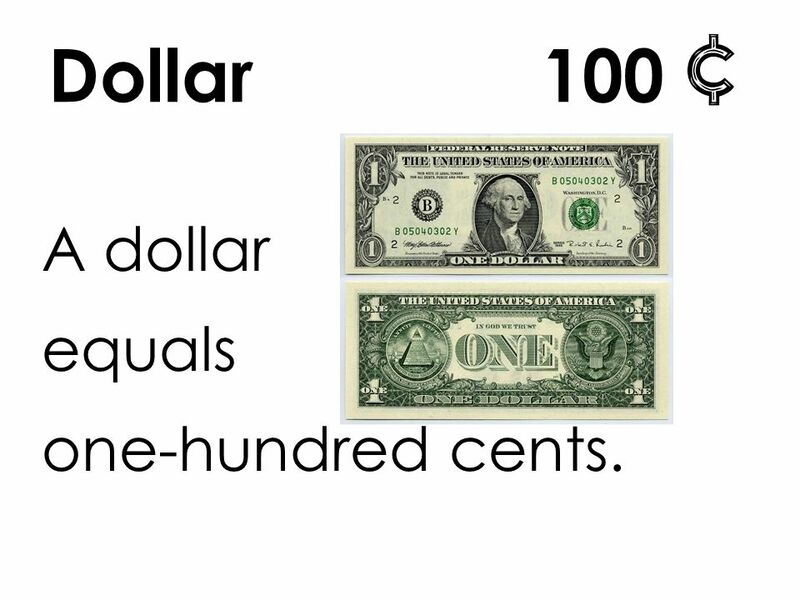 8 Dollar 100 A dollar equals one-hundred cents. 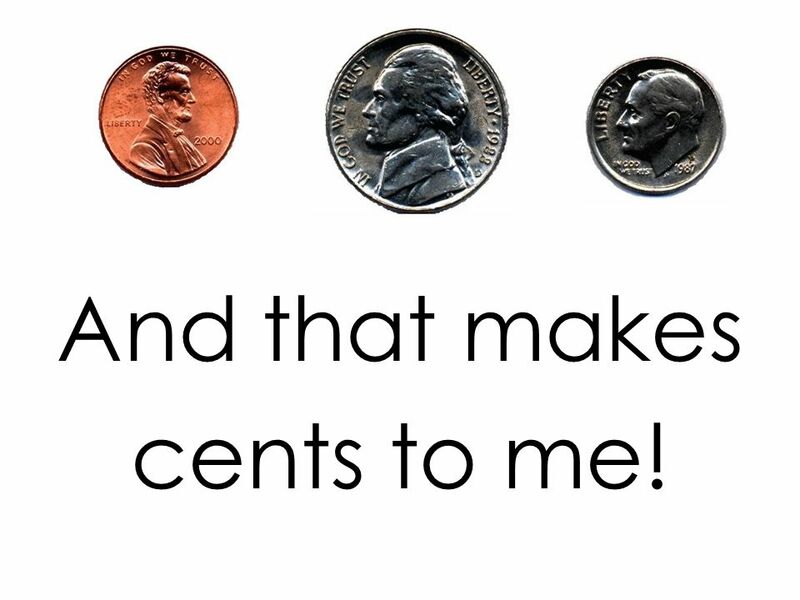 9 And that makes cents to me! 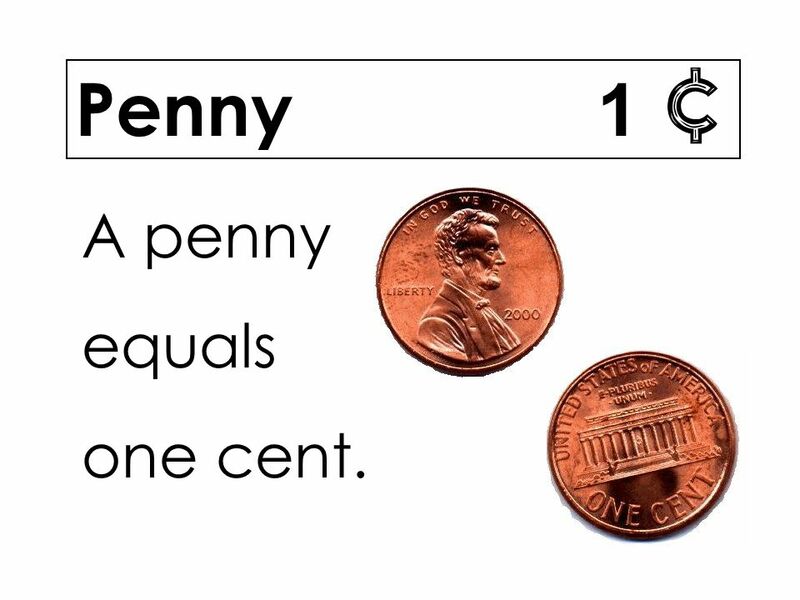 10 Penny 1 A penny equals one cent. 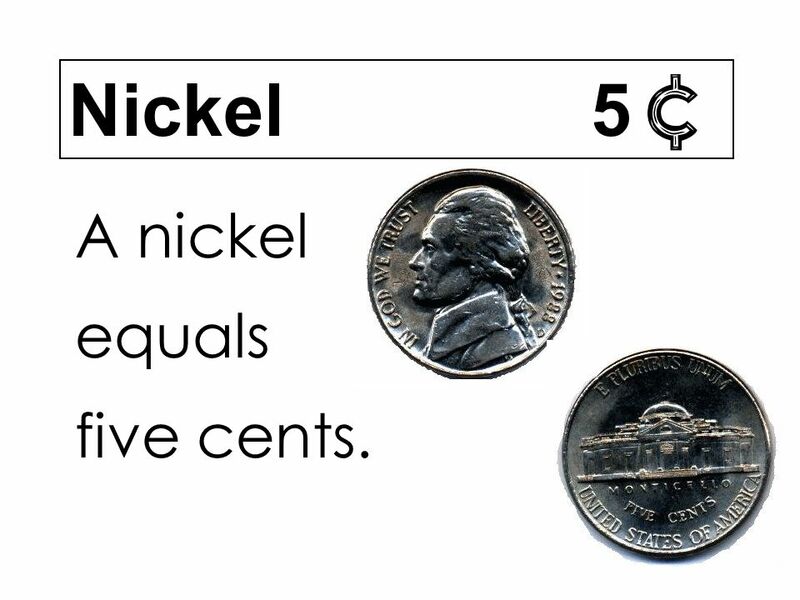 11 Nickel 5 A nickel equals five cents. 12 Dime 10 A dime equals ten cents. 13 And that makes cents to me! 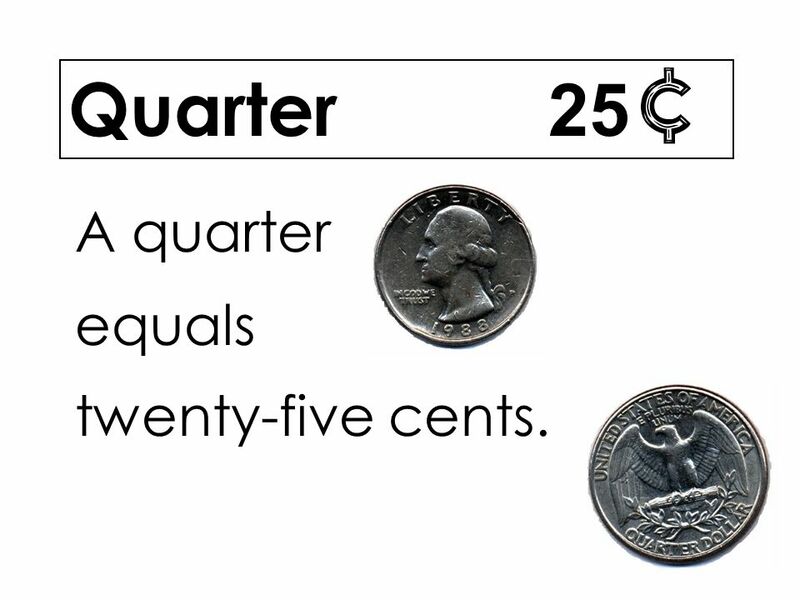 14 Quarter 25 A quarter equals twenty-five cents. 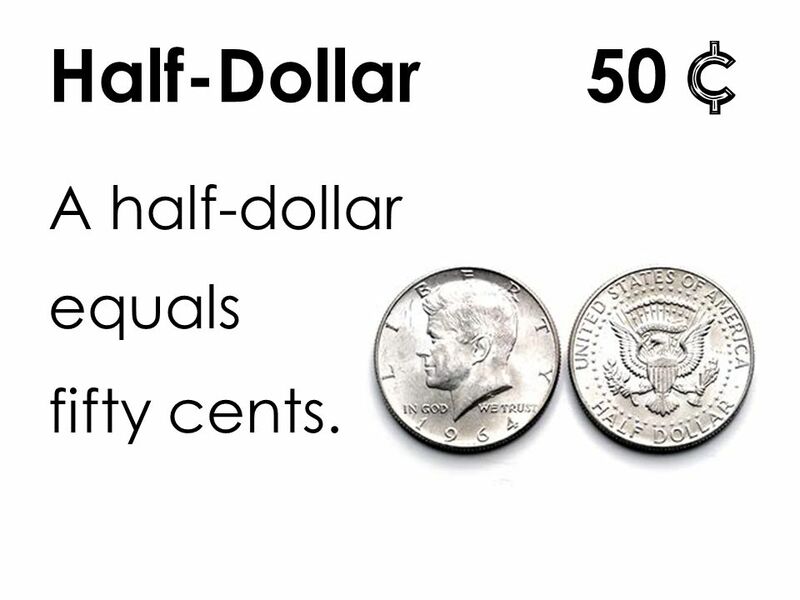 15 Half-Dollar 50 A half-dollar equals fifty cents. 16 Dollar 100 A dollar equals one-hundred cents. 17 And that makes cents to me. 18 And that makes cents to me! 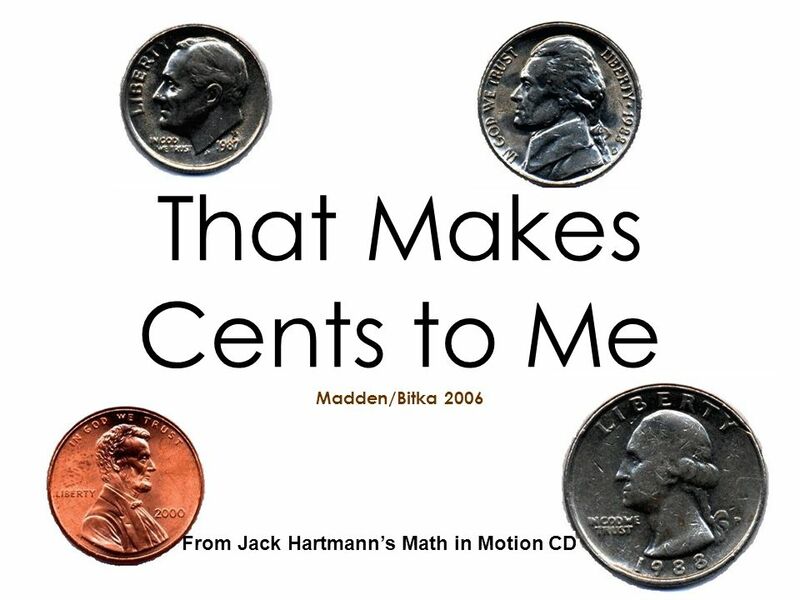 Download ppt "That Makes Cents to Me Madden/Bitka 2006 From Jack Hartmanns Math in Motion CD." Counting Money. How to Count Money 1. Know the value of each coin. 2. Sort your coins from greatest to least. 3. Start counting with the coin of greatest. The Money Song From Dr. Jean’s CD - Is Everybody Happy? Money Matters First Grade Math 1. What coin is worth $0.01? 1.Penny 2.Nickel 3.Dime. First Grade Lesson Identifying and Counting Coins Heather Richard First Grade Lesson Identifying and Counting Coins Heather Richard. A penny a dollar a nickel a dime = ©2009 abcteach.com. Counting Money & Making Change By Mrs. Wade One cent Five cents Ten cents Nickel Identify coins Penny Dime. The Value of Coins Dr. Beth McCulloch Vinson Athens State University PT3 Grant Funding, Summer 2000. MONEY! By: Kayla Stirpe -Students will be able to communicate effectively in social and academic settings. -Students will be able to identify and count. Cameron Gordon Computer Lab Project Mrs. Wilcox’s Class. The World of Money! The Basics of Money: Coins and Bills. Exercise What is the value of seven nickels? $0.35. What is your strategy for counting money?